Berlin – Life moves pretty fast. The Germans call it wanderlust. Don Quixote called it knight-errancy. Kipling called it roguing and ranging. A whole genre of literature sprang from the call of the road and the lure of adventure. Think “Robinson Crusoe” or “Treasure Island” or even “Lord Jim.”Now, imagine a man who travels day after day, relentlessly, not because he wants to or because he is paid to, but because he absolutely has to: because roads are his master, and he their slave. This is what psychiatrists call “dromomania,” ambulatory somnambulism — the traveling fugue. The patient who brought that condition to full clinical light, the most notorious dromomaniac in history, was Jean-Albert Dadas, a gas-fitter who deserted the French army in 1881 and criss-crossed Europe in a trance for five years, making his way on foot to Berlin, Prague, Moscow, even Constantinople. He had no memory of it. Two of the slightly random things I loved about Berlin when I visited last year were the figures on the traffic lights and the gas lights. It turns out lots of people feel the same way. Berlin has a reputation as one of Europe’s more modern capitals, but there’s actually part of the city’s infrastructure that is positively Victorian: its gas lighting. The German capital is the most heavily gas-lit major city in the world, its 43,000 lamps making up more than half the total remaining public gas lanterns still in existence. Many of these lanterns are beautiful, ranging from elaborate hydra-like candelabra dating back to the 1890s to simple, single teardrops. They also shed an unusually warm, yellowish light, a little dim compared to most big cities, but soft and atmospheric, especially when there’s fresh snow on the ground to intensify its glare. While these lamps are popular, it seems they have to go. Over 4,000 of the gas lamps will be removed by the end of next year, with the remainder phased out by 2020. Berlin’s government plans to refit city streets with more carbon efficient LED lights. In addition to consuming less power, LED lamps are also easily adapted to work with so-called “smart city” systems that might, for example, brighten or dim its beams depending on who is around nearby. This adaptability is one reason why similar LED lighting systems are being rolled out across the world’s cities. Perhaps motivated by his Communist surroundings, East German traffic psychologist Karl Peglau wanted a pedestrian traffic light for the proletariat. Everyone from the color-blind, to the elderly, to children uses sidewalks, he reasoned, so why not a “walk/don’t walk” symbol that makes sense to anyone—and, ideally, reduces traffic fatalities too. Thus was born the Ampelmännchen, or “little traffic light men,” the hatted, purposeful-looking indicators that helped direct traffic in East Germany and have since gained cult status. Is there anything more terrifying than abandoned amusement parks? Many such deteriorating parks are hidden behind security barriers, or camouflaged with faux facades in an effort to pretend that they do not exist. 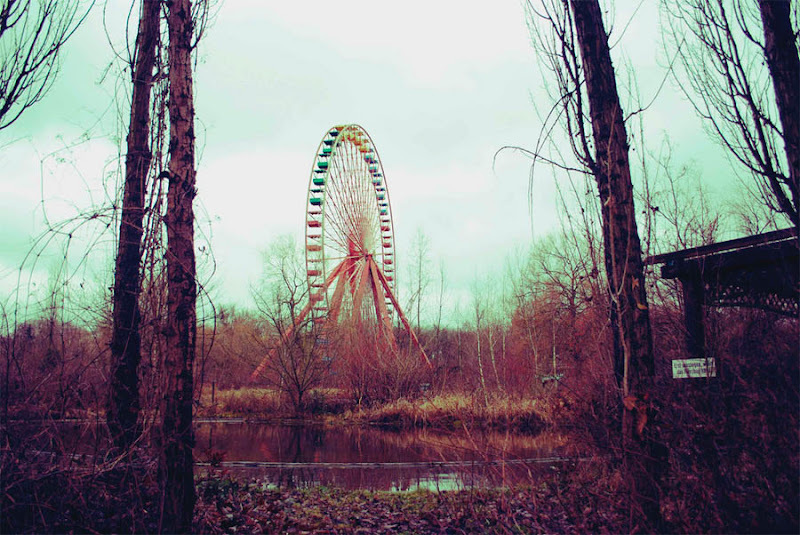 But this particularly fantastic place, Spreepark PlanterWald, is “hidden in plain view”. It is located smack in the middle of a major European city – Berlin – close to the much-visited Treptower Park.